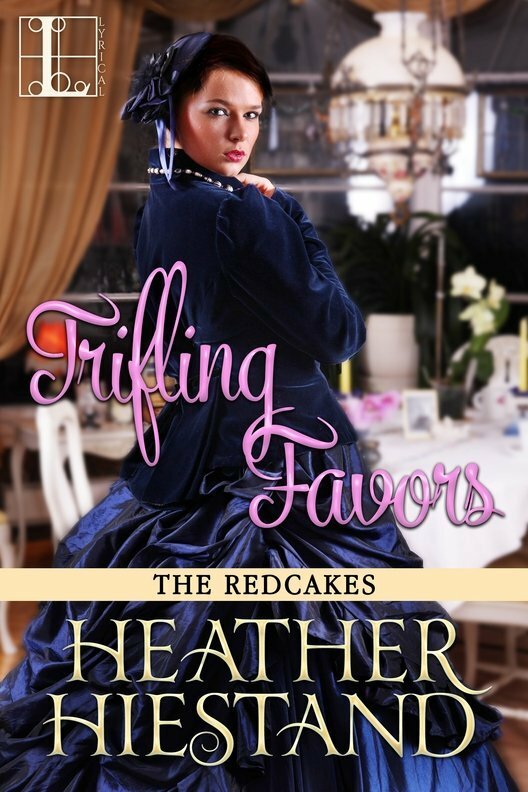 READ Trifling Favors (Redcakes Book 7) FREE online full book. Thank you to Judy Di Canio, Eilis Flynn, Mary Jo Hiestand, David Hiestand, Delle Jacobs, Abbey MacInnis, and Madeline Pruett for your critique assistance and support. Also, I’d like to thank my editor, Peter Senftleben; production editor, Rebecca Cremonese, and the rest of the Kensington team; and my agent, Laurie McLean, and the Fuse Literary team, for their support of the Redcakes series. etsy Popham had been paying for her mother’s murderous impulses most of her life, but she hadn’t expected a victim’s daughter to walk into her place of business. She knew her father had paid the family their usual annuity the day before, on the first of the month, as he had for nearly eighteen years. Violet Carter had the face of an ingénue: huge dark eyes with thick lashes, pretty rosebud lips, and a mass of curling blond hair that must have been assisted in its brilliance by the application of lemon juice and sun. Her black mourning gown dulled her beauty somewhat. Betsy finished smoothing the white tablecloth she’d placed on a recently vacated table and went to Violet, hovering by the entrance to the tearoom at the Kensington branch of Redcake’s. The locale was far too exclusive to be visited by a young working-class woman from Fulham, even one as pretty as Violet. Violet’s sweet face lost its look of desperation when she saw Betsy moving toward her. She took a step forward and clasped Betsy’s hands. “Oh, my dear friend,” she cried. Why would this girl think to call her a friend? She was the daughter of the woman who had poisoned Violet’s father. While Betsy toiled to pay the Carter family’s bills, she scarcely knew them as people. They were merely an unending debt her father had insisted was their Christian duty to pay. “This is my workplace, Violet,” Betsy said, pulling the girl into the entrance hall, away from the exclusive clientele who came to enjoy the mouthwatering pastries and light comestibles offered in the tearoom. On the other side of the hall, the double doors to the bakery offered a tasty selection to all passersby, and the customer might be one such as Violet, come in for a shilling cake or other special treat, after a day spent viewing art at the Victoria and Albert Museum, or shopping at John Barker & Co.
A pair of scrollwork iron benches awaited those elderly persons who could not stand while queuing for tables in the tearoom. As they were presently unoccupied, Betsy guided her unwelcome guest to the most unobtrusive one. “I am afraid I do not understand.” As she looked at the girl again, she wondered if her drab gown was her approximation of the Redcake’s cakie uniform. Cakie was the Redcake’s term for the tearoom waitresses, and they wore black gowns, designed to be manageable for girls who didn’t have maids to dress them. Practical as the garments were, they looked better than Violet’s sad frock. “My mother died yesterday.” Violet’s lush lashes fluttered down. “Excuse me? My father just visited with her yesterday.” Ralph Popham always walked the more than three miles from their house in Chiswick to the Carter home near the Putney Bridge alone, claiming it gave him time for prayer and reflection. “Yes, dear.” Violet squeezed her hand as if in comfort. “Now we are orphans.” Violet sniffed.
. Betsy wondered if her father would insist they continue to pay the Carters now that Mr. Carter’s widow was gone. Probably. Her father’s sense of guilt was unending. She would leave this detail to him and promise nothing. The door leading to the back rooms opened and Betsy saw Greggory Redcake peer out, as if looking for someone. Mr. Redcake owned the Kensington tea shop and emporium, and managed the business besides. Tall and attractively lanky, with a careless thicket of black locks, it was easy to think him younger than his twenty-eight years. His immediate family called him Gregorio because he was such a throwback to his mother’s Italian ancestry. Betsy would never presume and knew she was lucky to have her position. The owner of the flagship Redcake’s Tea Shop and Emporium, the Marchioness of Hatbrook, had recommended Betsy to Greggory, and she did her best to be the perfect assistant manager. Now, with Mrs. Carter deceased, it would be nice to hope that her labors might pay for a more comfortable lifestyle for herself. She sighed. “Yes,” Betsy said, pulling her hand away from Violet’s grasp and patting her shoulder. She glanced up again and saw Mr. Redcake’s approving glance. What did he think was transpiring? He kept to himself and she never really knew what he was thinking. When she stared back at him, he nodded at her and closed the door again. Should she go after him to find out what he wanted? It was her duty as his assistant to anticipate his every need. “Many of them are about my age,” Violet protested. “You’ve known me almost your entire life,” the girl said. “My mother taught me to keep a neat house, and you know I don’t have any trouble with followers. My mother told me you’d give me a character if I ever needed to work, though of course she hoped I’d marry instead.” She ended her speech with that afterthought. I’ve had to be the best. I had to pay your bills all these years. Betsy sighed as she finally made it through the door into the back room, whatever she had been doing before Violet arrived long forgotten. Her only goal was to find out why Mr. Redcake had been looking for her. “Who was that? Your cousin?” asked Winnie Baxter, the lead salesgirl in the bakery, as she stood up from the rack that held goods waiting to be loaded into the bakery cases. The same age as Betsy, she was the employee Betsy felt closest to, though she didn’t really have friends. “No, an old family acquaintance,” Betsy replied. “Oh? Are you looking for someone?” Betsy would hate to lose their best salesgirl to marriage, but it happened all the time. “If you were married, you’d have to do his wash, too,” Betsy said. She regretted her words when she saw the dreamy-eyed expression on Winnie’s round face. “Oh, I’d only marry a man who could keep me in a sweet little house, far away from here.” Winnie sighed. “I could take all day to do the wash. Wouldn’t it be grand to have time to scrub your whites truly clean?” Arms rigid, she hauled the heavy tray toward the bakery. “Let me help you,” Betsy said. She took one side and together they carried it in. After another twenty minutes spent helping to restock the bakery, during which time she discovered that their latest bakery girl, Miss Brown, was not working with a sense of urgency, she finally was able to go upstairs to Mr. Redcake’s office. Greggory Redcake stared through the small window behind his desk into the alley at the rear of Redcake’s. At this time of day, not much transpired at the loading dock. All the deliveries had gone out and a peaceful lull existed before an early afternoon rush to deliver items to private homes for teas and evening entertainments. The residents of the surrounding exclusive neighborhoods had taken to his Redcake’s branch quite enthusiastically. He’d never have thought, when his Uncle Bartley moved his family to London to open the first Redcake’s Tea Shop and Emporium, that he’d someday be in London himself, owning the second Redcake’s. But Uncle Bartley had spent time in London opening this location, then had given it to him as a wedding present. Now, less than two years later, he had no wife, but the wedding present consumed most of his time. What he really needed was a kind, efficient lady like Betsy Popham to manage his personal life as well. She had such a way about her with the staff. He’d noticed she turned tongue-tied around customers sometimes, as if she didn’t quite know how to act around their wealthy clientele. With the workers she did a corking job and was universally well-liked. A knock at his door had him standing up from the wide window ledge. He straightened his back and buttoned his coat as he went to open the door. “Mr. Redcake?” said Betsy, stepping into the room before he could respond. Her bosom brushed his arm as she went by. He wondered if she realized how often she did that. This question sent his thoughts tumbling toward the realization that Miss Popham had a larger bosom than most ladies, which led him to think about the rest of her: short of stature, round, and with the most perfect peaches-and-cream complexion. Her glowing skin showed that her full curves were Nature’s gift and not the result of eating too many petits fours. Greggory knew the only way to know how a woman would age was to take a look at a girl’s mother. He had no idea what Mrs. Popham looked like, but he’d bet the full curves would remain and not tend to fat later in life, as many girls did as they aged and had babies. One of the last conversations he’d had with Letty, before the sudden fever had ended her life, was a lament about what her figure would be like after birthing their twins. He’d had to reassure her that she would fit into her gowns in time, and that he still found her attractive, all of the things men said to their wives, not really knowing if they were true or not. But he’d never had the chance to find out what Letty looked like, post-babies. She hadn’t lived a month. Since then a succession of ill-bred wet nurses and nursemaids and baby nurses, an ever-changing assortment of surprisingly hard-eyed women, had been his in-home companions. He’d arrive at Redcake’s in the morning and see Betsy Popham and the soft-eyed, well-rested, pretty cakies in clean uniforms that didn’t smell like unwashed baby. Oh, he felt guilty for how good it felt to come to his business, leaving his home in wealthy Kensington Church Walk, nose to nose with his clientele, his children, and his dead wife’s incomplete decorating schemes. “Mr. Redcake?” Betsy asked again. “You wanted to see me,” Betsy said, pushing thick bangs off her forehead.